NUC Executive Committee – Page 5 – UNITY, Inc.
For the second year in a row, UNITY Executive Committee Co-Presidents have received an invitation to an event hosted by the President of the United States. Brian Weeden, Mashpee Wampanoag and Sarah Scott, Lummi Nation, will attend the 2014 White House Tribal Nations Conference in Washington, D.C. The purpose of the conference is to foster the relationship between the United States Government and American Indian and Alaska Native tribes. President Obama is expected to share remarks on behalf of his administration. As representatives of UNITY, Brian and Sarah will have an opportunity to meet with tribal leaders from across the nation. They will also attend breakout sessions on topics such as Government to Government relationships, Wellness and Mental Health, Education and Supporting Native Youth, Environmental and Cultural Resources. The conference will provide leaders from the 566 federally recognized tribes the opportunity to interact directly with the President and members of the White House Council on Native American Affairs. Each federally recognized tribe will be invited to send one representative to the conference. This year about 40 Native American high school students have been selected to attend the conference as Youth Ambassadors. This will be the sixth White House Tribal Nations Conference for the Obama Administration, and continues to build upon the President’s commitment to strengthen the government-to-government relationship with Indian Country and to improve the lives of Native Americans. Additional details about the conference will be released at a later date. The following twelve individuals were elected during the 2014 National UNITY Conference in Portland, Oregon to serve on the 2014 – 2015 National UNITY Council Executive Committee. Sarah Scott, 20, is an enrolled member of the Lummi Nation in Bellingham Wa. She is currently serving as the female Co – President of the National UNITY Council Executive Committee. She is also attending school at Northwest Indian College where she is going to attain an Associates Degree and her goal is to obtain a Bachelors in Educational Leadership and a Masters in Human services. Sarah partakes heavily in her culture and uses that to guide her in her journey as a mother and as a young leader. She is very honored to be serving her third term on the NUC Executive Committee and looks forward to serving her fellow peers. Brian Weeden also known as Moskwetah “Bear Heart” is a proud members of The Mashpee Wampanoag Tribe located in Mashpee Massachusetts on beautiful Cape Cod. Brian is currently a language teacher for the Wôpanâak Language Reclamation Project (WLRP) and teaches the Wampanoag Language. Outside of work Brian is a devoted tribal member who believes in giving back to the community. He serves on the Mashpee Wampanoag Tribes Enrollment Committee, Youth Advisory Committee and holds the current title of Chairman to the 2014 Pow Wow Committee. Back in 2009 Brian formed the Mashpee Wampanoag Youth Council and served as Chairman from 2009 until aging off of the council in 2012. However in 2012 Brian had the privilege of being elected Northeast Area Representative for the United National Indian Tribal Youth Inc. Executive Committee also known as UNITY EC. The following year he ran for Male Co President and did not succeed. However he did not give up and the following year he ran and became victorious.” I encourage everyone to chase his or her dreams. Don’t ever give up!” Over the next year as the newly elected Male Co President Brian plans on restoring the voice of the NUC (National UNITY Council) while amending the constitution and bylaws. If you have any questions or would like to contact Brian he can be reached via email at [email protected]. National UNITY Council Executive Committee Co-President, Nataanii Hatathlie, was recently interviewed on Emerald Planet. Nataanii’s interview, which ends at the 13:00 minute mark, may be viewed below. PETITIONS MUST BE RECEIVED BY 12PM SUNDAY, JUNE 29. National UNITY Council Co-President and Regional Representative Petition Forms are attached. Forms submitted in advance should be mailed or faxed to the UNITY office. Forms submitted during the conference should be submitted to a UNITY staff member at the registration table. Eligibility will be confirmed before ballots are prepared. Confirmed candidates will have the opportunity to offer a speech to their constituents before the NUC business meeting. Candidates are highly encouraged to attend the National UNITY Conference in Portland, OR June 28 – July 3, 2014 as elections for the National UNITY Council Executive Committee will take place at the business meeting during the conference. Should you have any questions or concerns, please do not hesitate to contact the staff at the UNITY office or the current members of the Executive Committee. We wish you the best of luck with your petition. Dominique Lombardi, the National UNITY Council Executive Committee Co-President, was featured in a September 07, 2013 news article, which appeared in a Riverside County California Newspaper. The article states, “Dominique Lombardi is a young woman with a mission: to be a positive role model for Native American youths throughout the country. Lombardi, a Desert Cahuilla Indian from the Morongo Band of Mission Indians and the Torres-Martinez tribes in Southern California, already has proven to be a strong leader. As a member of the Youth Tribal Council for Morongo, near Banning, she has taken an active role in pursuing her goals. The rest of the story may be read on The Press-Enterprise website. The National UNITY Council (NUC) was established in 1992 to serve as the representative arm of the UNITY Network. It is made up of a young man and young woman from each Affiliated Youth Council, who represent their respective youth councils on the NUC. Each year during the National UNITY Conference the National UNITY Council elects a twelve member Executive Committee that is responsible for carrying out National UNITY Council business during the period between its annual meetings. In carrying out this responsibility, the Executive Committee provides a strong, representative voice on issues facing Native American youth while advising and supporting the UNITY organization and all it stands for. The Executive Committee meets regularly to conduct business on behalf of the National UNITY Council and provides the all-important Native youth perspective during the planning process leading up to the annual Midyear Meeting and National UNITY Conference. Among its many other duties, the Executive Committee reviews and oversees the work of Council committees, drafts resolutions and position statements and represents the National UNITY Council to outside decision makers, partnership organizations, and the general public. 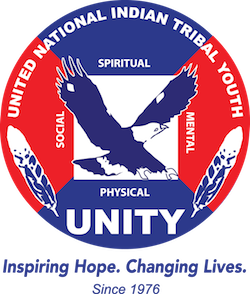 Additionally, each of the ten area representative has the individual responsibility for serving as the liaisons to Native youth in their respective regions while the Co-Presidents serve as the chief executives of the National UNITY Council and are voting members on the UNITY Council of Trustees. The following twelve individuals were elected during the July 2013 National UNITY Conference to serve on the 2013-2014 National UNITY Council Executive Committee. Dominique is an enrolled member of the Morongo Band of Mission Indians tribe in Southern California. She is honored to be elected on the National UNITY Council Executive Committee as the Female Co-President. As a former regional representative, Dominique desires to continue her local work of encouraging Native youth to get their education and continue on to higher education. Dominique is a current student at Mount San Jacinto College. She will transfer in the spring of 2014 to the University of Redlands to pursue a Liberal Arts degree for early childhood development, choosing to focus on elementary education. She believes children at the elementary age start to determine their life’s direction and need much discipline and guidance. Dominique aspires to be a teacher that helps children become successful in all they set their mind to. She would like to finish school before returning to her reservation to teach the children of her tribe. Dominique once held the “Daughter of Morongo” royalty title for three years, from 2008-2011. Dominique is excited for the upcoming year and to serve all of the nation’s Native youth. Email: dlombardi.morongo[at]gmail[dot]com. Nataanii, 19, is a Navajo originally from Arizona, raised in New Mexico, and currently a student at Stanford University in California where he is majoring in Management Science & Engineering with plans to attend business school. Nataanii, a distinguished leader, has been with UNITY since 2009 and served as a National UNITY Council representative for three years then served on the Executive Committee for three years as Male Member-at-Large, Southwest Representative, and Vice-President before being elected as the current Male Co-President of UNITY. He started with the Kirtland Central Diné Youth Council and worked with the Navajo Nation Office of the President and Vice-President to create new youth leadership groups with the vision of organizing agency youth councils to partner with the Navajo Nation government. He now works as a social entrepreneur specializing in health and youth empowerment. Nataanii plans to help expand the UNITY network, build alumni support, reconstruct UNITY’s website, fundraise record amounts, increase youth engagement, and provide more resources for UNITY youth. Email: mrnataanii[at]gmail[dot]com. The video viewable in the player below illustrates the kind of positive initiative undertaken by the members of the National UNITY Council. UNITY Day activities took place in 2011 as the result of a resolution passed by the NUC at its annual business meeting during the 2010 National Conference in San Diego, CA. The purpose, which is described in greater detail in the video, was primarily to, “promote lifestyles free from abuse of alcohol, drugs, and other substances.” Still a good idea. Through their actions, Native youth can and do make a difference in their communities. Sarah Schilling, Little Traverse Bay Bands of Odawa Indians, was one of the youth honored. Sarah is currently serving as a member of the National UNITY Council Executive Committee and is a founding member of the Waganakising Eshkiniigijik UNITY Council. Read the March 18 article featured on IndianCountryTodayMediaNetwork.com to learn more about Sarah and the other youths’ experiences during their visit to the nation’s capital. In a more recent Indian Country Today story, Sarah talked about her influences and background that led to a leadership role within her community and beyond. Congratulations to Sarah for the honor awarded by the Center for Native American Youth and a much deserved thanks for the dedicated and successful efforts that make her a Champion for Change. The following story is from a White Mountain Apache Tribe Education Department news release that was issued on December 01, 2012. Jared is currently the Co-President of the National UNITY Council’s Executive Committee. Congratulations Jared for being elected to this new leadership responsibility. Whiteriver, AZ – The National Congress of American Indians (NCAI) convened for the annual convention October 21-26 in Sacramento, CA. NCAI is a national organization that advocates, lobbies and addresses issues throughout Indian country. During this year’s annual convention, the NCAI Youth Commission elected White Mountain Apache tribal member Jared Massey National NCAI Youth Commission Co-President. Throughout the week, Massey worked with native youth from tribes throughout the United States and focused on encouraging the Native Vote campaign for NCAI. The Youth Commission election was held October 24, in which Massey was declared the winner after garnering the most votes out of a field of four (4) young men. The following eight members of the 2012 National UNITY Council Executive Committee have provided biographical sketches to introduce themselves to those of the national UNITY Network. Amira Madison, Female Co-President: Amira is a twenty-three year old recent graduate of Northeastern University with a Bachelor of Arts in History and a minor in International Affairs. She was born in Boston, MA and grew up there till she was eleven when she moved to Martha’s Vineyard to be near her tribe. She began with the Aquinnah Youth Group and enjoyed traveling to leadership conferences. She aspires to become a doctor. She is an active member of the Wampanoag Tribe of Gay Head Aquinnah and has represented the Wampanoag Tribe at UNITY (United National Indian Tribal Youth Inc.) where she began in 2006. She has worked at the Aquinnah Cultural Center, Wampanoag Tribe of Gayhead Aquinnah, Native American Youth Enrichment Program, Boston and at Jumpstart as part of her Northeastern work study. Amira is also a sister of Alpha Pi Omega. Currently she is taking the fall off to focus on relaxing and enjoying some fun! Jared Massey: Jared Ivins-Massey, is an enrolled member of the White Mountain Apache Tribe of Arizona. He was born and raised on the Fort Apache Indian Reservation in Northeastern Arizona. Jared is the son of Leo and Rolinda Massey of Fort Apache, Arizona and hails from the community of Seven Mile and Cibecue, Arizona. Jared is a proud graduate of Alchesay High School where he was elected student body president and elected the White Mountain Apache Youth Council Male Co-President. Currently Jared is a double major studying political science and justice studies. Jared currently resides at the Arizona State University Polytechnic Campus in Chandler, Arizona. Jared has received Nemours awards and acknowledgements, one being the current United National Indian Tribal Youth, Inc. National Male Co-President, representing the Native Nations in the United States. Jared states, “With no Vision youth cannot prosper but with the guidance of our elders, a Vision is in our sight.” Jared is a motivational speaker, traditional dancer and plans to one day return to the White Mountain Apache Reservation and serve as a tribal attorney.